The Los Angeles Kings have activated forward Andy Andreoff from injured reserve, Kings Vice President and General Manager Rob Blake announced on Dec. 7. The 6-1, 203-pound native of Pickering, Ontario appeared in 22 games earlier this season with the Kings, posting two points (1-1=2) and 36 penalty minutes. He has missed five games thus far due to injury. 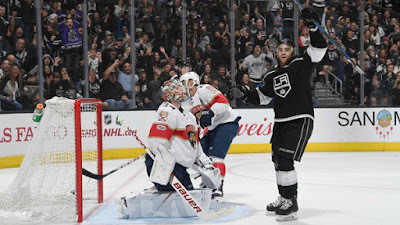 Selected in the third-round (80th overall) of the 2011 NHL Entry Draft by the Kings, Andreoff has appeared in 136 career NHL games posting 17 points (11-6=17) and 200 penalty minutes. The Kings continue a three-game homestand tonight against Ottawa at 7:30 p.m. The game will be broadcast on FOX Sports West and KABC Radio 790 with pregame shows beginning at 7 p.m.